There is a picture of Smokey's engine on The Ponysite form 1969 and the motor is blue. Maybe just the Chevy motors were gold. As for the hood pins the second picture has them where the stock hood bumpers would go. I know that is a stronger mounting point compared to the top of the rad support lip which you can flex with your hand. Not really sure if that is why they moved them, just guessing. The aluminum air boxes are a work of art! I didn't realize the Mustang radiator support is semi-flimsy at the top. On a Camaro, that area is strong and not flimsy. I can't think of a Camaro that did not mount its hood pins in a place other than on the radiator core support. The top is only 1 layer of sheet metal with a little acid dipping thrown in. The pictures are of my car that I am working on. I reinforced the top lip of the rad support. Some 69's had the pins inward like mine, mostly the Shelby cars and some outward near the fender like the Bud Moore cars. 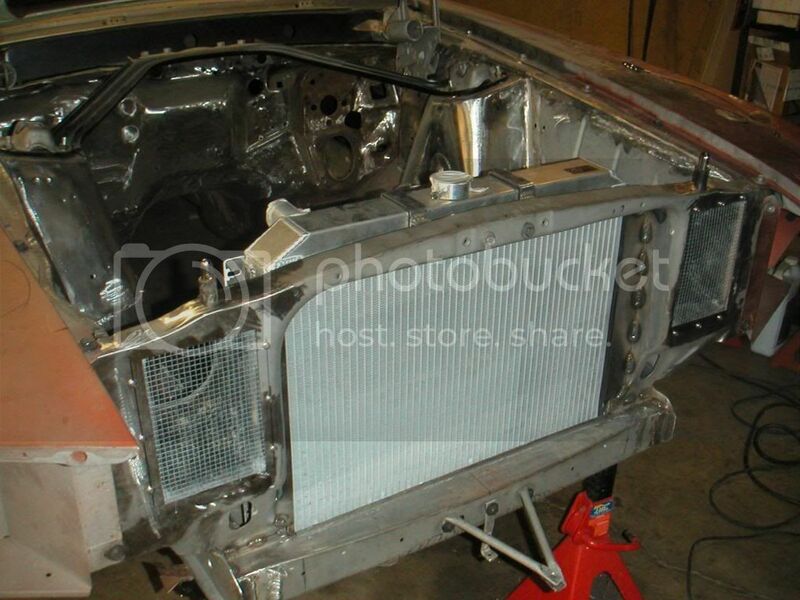 Thanks for the pics of your car and in particular for showing us the radiator core support and how you have beefed up the area around the hood pin. Nice touch on the opening for the radiator too. "Terrific! Would you please post some pics of the manifold and carbs in this thread when the show is over?" I recognize the crossram on the right, but maybe Klvn8r or Crazyamc can confirm what is shown on the left. Ken, I wish you well in that quest, I'm sure something will come of your display, and of course here on this forum, the "Best" source of accurate period correct information! Do you have any casting numbers or stamps left on the intake? The small photo I posted doesn't show much, but it looks to be pretty heavily modified. Back in the day(and even some now) alot of engine builders would have to cut the intake to head surface back and use plates to get a better transition from the intake runner to heavily modified heads. This was especially common with the Pro Stocks with their welded heads to achieve the port sizes they needed. I believe the later Wally Booth Pro Stock engines used an intake of this nature. Do you have any history on your particular intake? It looks like it could be one of the Booth variety. Those runners look like they have been shortened (correct me if I'm seeing wrong) but are still awfully long for road race responsiveness. I should have some photos in my collection of the Booth engines, I'll try to post them. Ken, Good luck on your search. I know a some of the Kenosha crowd was at the show in Chicago as both the Wally booth Pro-Stock cars were there, and are based in Kenosha. I’m sure word is spreading. There is some crazy AMC stuff stashed away in south-eastern Wisconsin. Some speculate that Roberts (OG69Z) Traco intake, rather than the tunnel ram was used by AMC later in the ’69 season. But from pigpens comments in an earlier thread that may not be the case. Also note that the bulge in the hood is wide enough to accommodate an airbox on top of the cross-ram intake. Note the room constraints on the cross-ram’d ’68 Javelins. I’d bet there wasn’t much more than 1 inch between the carb top and the hood. Here's a link to the youtube video you're talking about. You're right that it is from Donnybrooke in 1969, not 1968. The link below shows the second part of the Donnybrooke video. Here is a little bit of Dominator carb info. 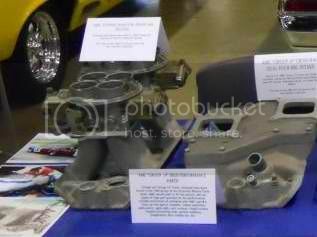 We have plenty of pictures of the Booth, Arons, and Maskin/Kanners intakes and even the WIBG pro stocker Gremlin. Most of those are extremely modified and were of the Edelbrock UR-18 variety. 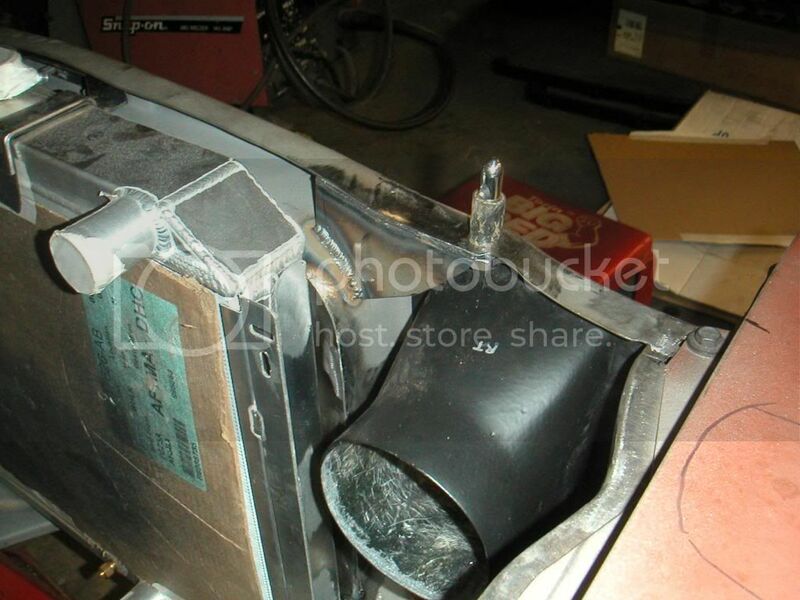 I even have a captioned picture of a Weiand "channel ram".....but Weiand claims no such intake was built for an AMC. 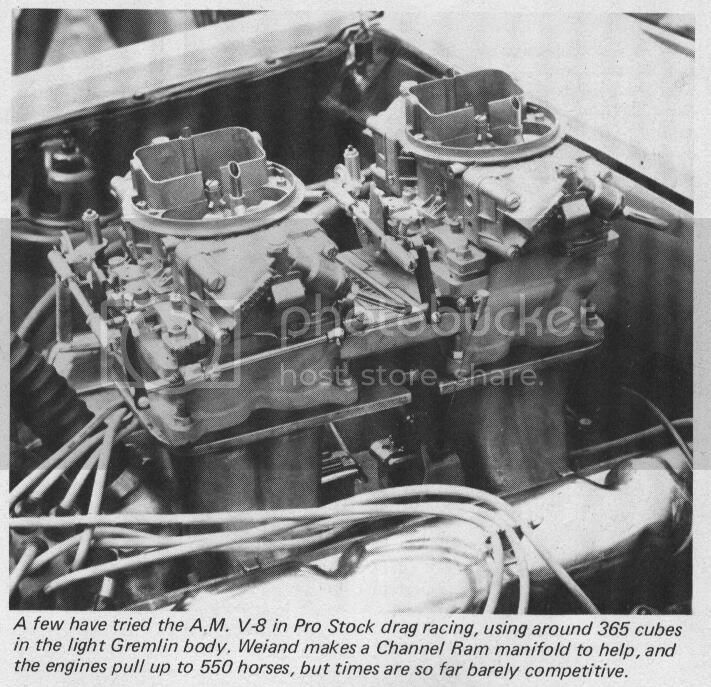 If I'm not mistaken, the AMC drag racers were sectioning the cast iron heads, making the ports even taller than could be cut from a factory head. There is a pro-stock intake here in Texas, as well as some of the pro stock heads in another area. This is great research! Some good links from 1109RWHP, Thank You! Good photos of the Dominators too. I don't think anyone can question the existence of the Dominators in the still photos that have been posted by Jon. I personally don't even doubt the fact that Mr. Kaplan may have tried running a drag race designed tunnel ram. Not being disrespectful in any way, his engine building skills have never been the pinnacle of his racing legacy. Apparently it wasn't the "cat's meow" , especially as klvn8r stated "Kaplan barely even remembered the tunnel ram". It seems it would have been a high point in his recollection if it had worked out. This is the link I was originally looking for. Too bad the first phot will not load. Good picture of the BIG air box.